RATE NOTES: Email for discount on rates for off-season visits for more than 5 nights (November through April) . Off season rate is normally $225 per night, minimum 3 nights). High Season rates (summer) vary; highest midsummer rate at $300 nightly. Summer rental is weekly Saturday to Saturday. If you are aesthetically minded, if you are looking for something particularly charming and special, you will love this Victorian waterfront cottage totally restored from the ground up in 2016. 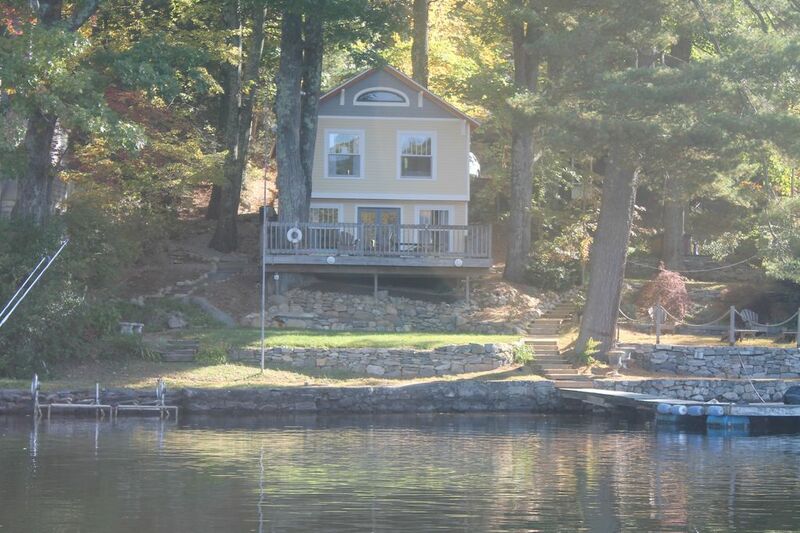 If you are seeking a very nice spot on the lake, you will love this property. Canoe, Kayak, Sunfish Sailboat, and more to enjoy. If you have rented cottages before, you know that location on the lake makes a difference. Our cottage is located on the favored east side of the lake, with best sunshine. It is located away from the boat traffic and boat wake waves, on a quiet cove open to the largest of the lakes bays. Nice swimming area for kids. Its has the important things experienced visitors recognize. It is a Victorian beauty, but fully restored in 2016 to high standards. Toasty warm in winter with lower level radiant heated floor, air conditioned for summer. Fully equipped kitchen, open-concept. We re-purposed original and vintage materials for this loved Victorian era cottage during our restoration. Every window and door has a story. Just ask us! Easy to use fireplace. Great for crisp mornings. Bedrooms include: one queen, one full and 2 bunks. Wake up in the queen and full bedrooms to sunrise on the lake. Spectacular views. Also upstairs, is a comfortable reading area and desk, a full bathroom with a 2 person, fully tiled shower, while the downstairs bath boasts a sparkling, new claw foot soaking tub. Downstairs, you will find a fully equipped kitchen, full-sized fridge, dual-fuel stove (gas stove top/electric oven), dishwasher and apron farm sink. Guests can dine on the old world dining table and Hitchcock chairs made locally, or at the kitchen peninsula. We have an open concept kitchen/dining/living room area which opens, through french doors, onto a large deck, just steps from the lake front. Enjoy the gas grill and picnic table for afternoon BBQs or glowing white lights and sunsets for a lovely evening dinner party. Bring your boat or jetski and tie up at our lakefront dock. This lake is great for swimming, boating, water-skiing and fishing. Private lawn and water front. Sunny side of the lake. The cottage is close to 'the Secret Spot,' (shallow area great for small children to play in the water). We live next door to the cottage. Our boat is parked on the south side of the dock in front of our place, your boat, if you bring one, is docked on the right north side directly in front of your cottage. Our area offers wonderful restaurants and grocers using locally produced food, Farmer's Markets (don't miss Litchfield's Saturday Farmer's Market! ), the Gilson Cinema/Cafe, Antiquing, nearby fly-fishing, hiking, and biking. Stop in at a local farm for just picked corn or tomatoes, or an after dinner ice-cream cone. For anyone up for a Berkshires experience, we are less than a one hour, country drive from Tanglewood, Shakespeare and Co., Stockbridge, Great Barrington, Lenox, and the Outlets at Lenox. During the summer, we request a minimum 7 day booking, Saturday to Saturday. Also, we cannot accommodate pets, due to potential allergies of renters. However, there is a highly respected kennel close to the other side of the lake. Of course, it's great in the summer, but fall and winter offer their own special activities. Fall leaves, apple picking, hay rides and pumpkin patches in the country. Winter snow, skiing, flannel sheets and cozy fires. Our cottage can comfortably accommodate all seasons! Long time lake resident, long ago it won my heart. We made a lot of memories over the years here. When the time came to rebuild the cottage, we wanted to keep it true to the early 1900's cottage it had always been. It has all the modern conveniences now, but despite this, I hope you agree we maintained its authentic charm. It still feels like the cottage our family grew up in over those many golden summers, long to be remembered. We welcome others now to make special memories too. Great property and location on the lake. Bathroom on the bedroom level has a shower. Bathroom on the lower level has a soaking tub. Direct private waterfront, dockage for boat, jet ski lift. Radiant flooring, forced air, gas fire place. Parking for 2 vehicles. Possible garage for long term. Additional street parking. Gas cooktop, vented to outside. Electric oven. 40 inch smart tv, cable. Large private deck with picnic table and gas grill. Deck has railings and locking gate. We loved our 3-day staff at the Lone Pine cottage just before Christmas 2018. The deck is a great size and even though it's winter, we loved standing out there watching the ice on the lake and the fog roll through after the rain.The cottage is a great size and the gas fireplace in the main living area keeps it warm and cozy. The lake is beautiful; really nice taking a drive around looking at the houses! Great location, central to Main St and other places. Thanks for a lovely stay! We loved our long weekend on the lake. The house was perfect for our family. Our kids loved the bunk beds and the books available. The fire was cozy and everything was comfortable. Thank you! I can't say enough good things about this place. Two friends and I stayed here for a guys weekend of fishing and relaxation and it was perfect. The house is immaculate and was very comfortable. John was a great host and we look forward to heading back next year. This was a great place. We traveled all over the state and into Vermont. John was great. I would suggest having a list of things to do in the area as well as a detailed map of Connecticut and the surrounding states. We just couldn't orient ourselves and get the overview of the state just from our phone maps. Anyway it was great! The house is beautiful. I highly recommend this place. The Lone Pine Cottage is a wonderful house right on the lake. The Victorian had been restored with attention to detail. It was very clean and quite comfortable. The house had a lot of character with all the unique windows, clawfoot tub, very cool stove and rustic stone wall by the stairway. While the galley-style kitchen was a little tight when their were multiple cooks, it was well-equipped and we made many delicious meals. The deck was a great outdoor "room" with plenty of seating and a nice view of the sunset and at night the rail had little lights on a timer. The tree growing up through the deck was impressive. We also enjoyed gazing at the stars over the lake while sitting on the dock. We had lots of fun exploring the lake with the canoe and kayaks. The water was clear and we had fun swimming and floating right from the dock. Jack was kind and very helpful with whatever was needed, but not at all intrusive. He was a wonderful host. We visited two area wineries, Sunset Meadow Vineyards and Haight-Brown Vineyard which made for rainy day fun. We enjoyed hiking in the People's State Forest in Barkhamsted. We liked our Italian dinner at the Venetian Restaurant on Main Street in Torrington, especially the tableside Caesar salad. We spent most of our time relaxing in this cozy cottage on Highland Lake. We had a terrific week on HIghland Lake. The house is lovely, just right for our family (including our 5 and 7 year old daughters). Quaint and charming bedrooms, updated and clean bathrooms, and small but great kitchen. The deck is outstanding, like an additional room outdoors! The lake is perfect, great time canoeing and kayaking. Fun swimming off of the dock for hours a day. The Owner was so nice, very available, but not at all intrusive. All in all, an excellent place to visit, we highly recommend it!! In off-peak months (September through May), feel welcome to inquire about short term lease. The home is state of the art, an ideal executive rental for a period of months, in a remarkable setting, great year round. In Summer months, rental week runs from Saturday to Saturday.